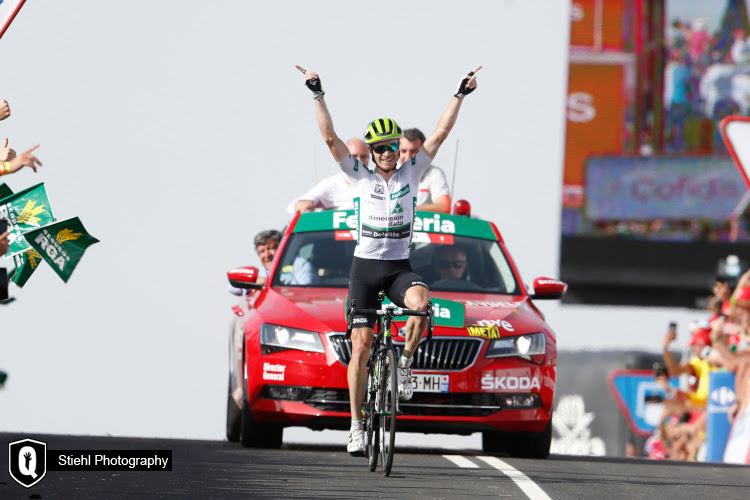 Ben King won his second stage of La Vuelta for Team Dimension Data and rode incredibly to cross the line ahead of Bauke Mollema (Trek-Segafredo). Third spot was filled by Dylan Teuns (BMC Racing Team). Today’s stage was a big day in the mountains and the 200km stage included four category climbs, including the special category climb, to the summit finish of La Covatilla. A break was established very early into racing and Ben King was part of the select group of 11, for Team Dimension Data. Our American rider was in the mix through all the climbs today, picking up valuable King of the Mountain point, which saw him moving up to 2nd spot in the KOM standings with 36 points. Through the day, the lead for the break stretched to over 9 minutes, and that put Ben King in the virtual leader’s jersey. Groupama – FDJ worked at the front of the peloton to protect the jersey, but only when Team Sky joined the chase did the lead start to drop. Ben King attacked and went off the front of the race with Lluis Mas (Caja Rural-Seguros) on the steep section at Candelario. King dropped him and started the ascent up to La Covatilla. Mollema put in a strong ride to try and bridge across to King on the taxing climb, bringing the gap down to 18 seconds. Ben King dug deep to make sure that he was first to cross the line, taking his second win in this year’s La Vuelta. With his win, King moved up in the general classification and is now 18th overall. Louis Meintjes finished 21st on the stage and showed positive signs to stick with the GC group until deep into the final kilometers of the stage. It was a performance that bodes well for our South Africa climber with the tough two weeks still to come. Ben King- Rider I think the second win hasn’t sunk in yet. I don’t think I have suffered that much in my career. Being chased by a guy like Mollema is a lot of pressure and it took a lot to keep believing and keep suffering that much. But I know what it means to me, what it means to the team and to the people who support and believe in me. I think it was a mental battle between us in the last bit and 20 seconds is not a big gap. We were just separated by meters on the climb and it just stayed the same and we completely fired, dying a thousand deaths. I’m really proud and happy to be out front again and fly the flag for the team and Qhubeka. It was a special day, and a special La Vuelta so far and it’s not even over. Founded in 2007, Team Dimension Data for Qhubeka became the first ever African cycling team to gain a WorldTour license, in 2016. In the team’s palmares you can find a Milan-Sanremo victory, numerous stage wins at the Tour de France, Giro d'Italia and Vuelta a Espana, two Tour of Britain GC victories, and 42 National Championship titles. The team has bases in South Africa, the Netherlands and Italy. It’s also known as Africa’s Team due to its focus on helping African talents to the world stage of cycling. The team believes #BicyclesChangeLives and race to raise funds for the Qhubeka Charity which provides bicycles to people in Africa. #DoYourPart and gift a bicycle or part of a bicycle, by clicking here. Qhubeka is an Nguni word that means “to progress”, “to move forward”. Qhubeka (qhubeka.org) partners with communities, public sector, private sector, and non-profit organisations to provide people with bicycles in return for working to improve their community, environment or school attendance. Dimension Data (dimensiondata.com) uses the power of technology to help organisations achieve great things in the digital era. As a member of the NTT Group, we accelerate our clients’ ambitions through digital infrastructure, hybrid cloud, workspaces for tomorrow, and cybersecurity. With a turnover of USD 7.5 billion, offices in 57 countries, and 28,000 employees, we deliver wherever our clients are, at every stage of their technology journey. We’re proud to be the Official Technology Partner of Amaury Sport Organisation, organiser of the Tour de France, and the title partner of the cycling team, Team Dimension Data for Qhubeka.